If you follow me on Instagram, you’ll know that I was recently in California, working on a wonderful new digital meditation album for you. Well, it’s here! Extraordinary: Meditations for a Magnificent Life. Ooh la la! This magical creature was made with love and shared with love. And I’ll tell you more about it in a bit, but first I want to take a step back and walk through why meditation is an important addition to your day. Not everyone practices regularly and some of us could use a little help or a refresher. But no matter how busy your life is, it’s totally possible to create a meditation practice that doesn’t add one more annoying thing to your already bloated to do list. Your practice can be simple, doable and unintimidating. And here’s the dealio: meditation really works. It will help you be the best version of you. But… what you put into it, is what you get out of it. 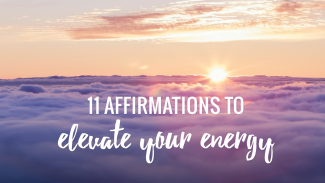 So if you want to be kinder, happier, more grounded, confident and self-assured, this practice will help you do it—while also radically transforming your life for the better. Not to mention, it’s pretty badass for reducing stress and improving your overall health. And if you want to really go deep, that’s where guided meditations come in. These are especially good for folks who have a tough time practicing on their own. Or for when you have a specific focus you want to work on–like forgiveness, healing, manifesting and so on. Or if you just get super bored on your own and need a buddy (like moi) to do it with you. “Hi you, I’m here to help” Want to meditate together? Let’s do it! Today I’m sharing one of my shiny and new meditations with you—Magical Intuition (listen for free below!). Magical Intuition is about tapping into your inner wisdom. The truth is you can access your internal guidance anytime you need it—just go inside and ask. This track will remind you that you already have the answers and it will show you exactly how to access them and listen. It’s just one of the many meditations in Extraordinary: Meditations for a Magnificent Life. 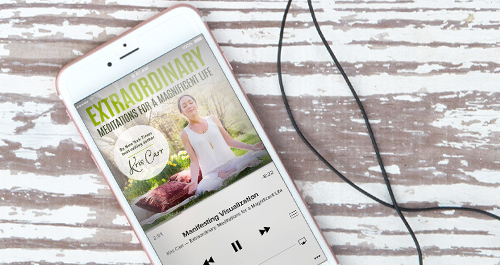 Get the whole Extraordinary: Meditations for a Magnificent Life album here now. This beautiful album was written in Venice, CA and recorded in Woodstock, NY. (How much hippier can you get?!) It’s designed to help you shift from ordinary thinking to extraordinary living. To put you in the mindset of greatness, so you can create a life that nourishes you at the deepest level. Barriers to awesomeness, be gone! You see, I believe that anything is possible for you—anything. As the Buddha once said, “What you think you become. What you feel you attract. What you imagine you create”. Extraordinary: Meditations for a Magnificent Life does just that. It uses a combination of guided meditations, contemplations with mini-spiritual talks, breathing exercises, mindfulness training and affirmation work, to help you own your power and manifest your deepest desires. I know that sounds like a tall order, but the shizzle really works. Bonus: A Free Companion Journal! These meditations will help you create a fulfilling life that nourishes you at the deepest level. Think of each track like a powerful seed that you’re planting in the abundant soil of your subconscious.You know what helps water those seeds? Journaling. Which is why I’ve also created a digital journal workbook to go with the album. Whenever you’d like to take a particular meditation deeper, just grab your journal and reflect on the prompt provided. This will help to expand on and reinforce the positive, self-loving mindset the meditations are intended to create. My hope is that this work becomes a catalyst for making your dreams a reality, and that it helps you love and cherish yourself. I offer it to you for your highest good, biggest impact and deepest healing. 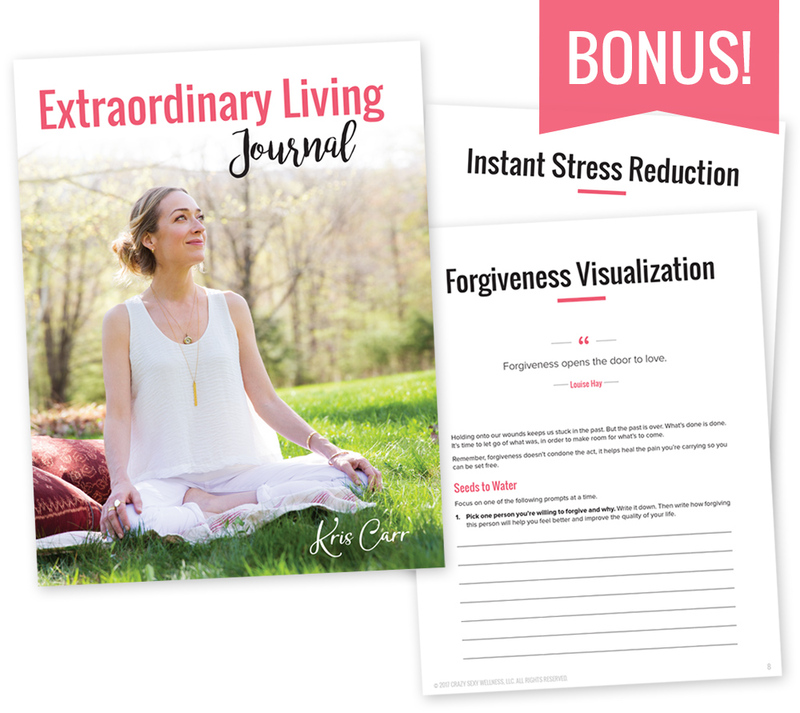 Get your copy of Extraordinary: Meditations for a Magnificent Life + FREE journaling prompts now. P.S. Did you listen to your free guided meditation? 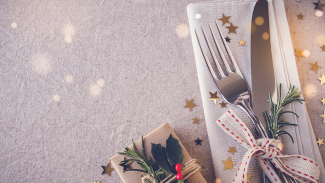 Enjoy this gift! Be sure to listen to my Magical Intuition meditation—and tap into your inner voice. Listen here. Beautiful l actually cried when lheardthe message from my soul. Tthankyou for your wisdom guidance and sharing . Healing tears. Love you, Colleen. Me, too, Colleen. I’m facing a very touchy situation with my 18 year old daughter. I’m forwarding it to her, as well. I needed this me-time-out so badly right now. I also loved the part about letting go and trusting Intuition to drive me to my desired destination. Thank you for the guided meditation. Really enjoyed the free meditation. I was looking forward for a second album. And here it is the announcement in my email box. Perfect for a Christmas gift to myself… Will listen to the free sample once back home but I know already it will be inspiring just like the other meditations. Thank you Kris for all the sweetness you bring everytime ! Of course I had to have these!! I have the other Meditation Album and LOVE it!! This album is just what I need as I start a new venture in 2018 and am trying very hard to believe that I CAN DO THIS and I deserve any goodness that comes my way because of it. Thanks, Kris. Hope you got just as much from creating this as I will from using it! Sending you Love and Lusciousness!! Wow, this is perfect timing for you Barbara and I really think it will help. Blessings to you and your dreams. Oh and you can do it. That’s a fact. x! Is there a track listing? Sure is, just click the link above and you can read all about the album, including the track list. I adored your last album Kris! I’m so in need of this second one! Just listened to your sample track and it was exactly what I needed. Your voice has become that of a familiar friend. Thank you for all you do. Excited to amp up my practice again. Also, the picture of you above is stunning. You are a true light! Thank you Stephanie! That means a lot to me. I really hope my new album serves you. It’s has a special place in my heart. xo! I love your guided meditation! Thank you for creating this and sharing with all of us! Thank you Kris, beautiful meditation! How long are each of the tracks? My new album, Extraordinary: Meditations for a Magnificent Life, will give you the tools to create a life that nourishes you at the deepest level. Sample a free track today!